Hat-tip to Jack for this bit-o-fun asking "what tarot card are you?". The World is the final card of the Major Arcana, and as such represents saturnian energies, time, and completion. The World card pictures a dancer in a Yoni (sometimes made of laurel leaves). The Yoni symbolizes the great Mother, the cervix through which everything is born, and also the doorway to the next life after death. It is indicative of a complete circle. Everything is finally coming together, successfully and at last. You will get that Ph.D. you've been working for years to complete, graduate at long last, marry after a long engagement, or finish that huge project. This card is not for little ends, but for big ones, important ones, ones that come with well earned cheers and acknowledgements. Your hard work, knowledge, wisdom, patience, etc, will absolutely pay-off; you've done everything right. Meaning of The World tarot card. The environment of the supraconscious creative mind is unitarily chaotic. To dowse the mind is to pull a thought forward from this unitary chaos into the rational mind for examination and analysis. In this manner, what is hidden becomes revealed, and what was lost becomes found. It becomes a method of expanding awareness - of oneself, one's connections and one's environment. An odd mix of the few points pulled from the unitary chaos of this morning's dream. black eye, chanah, drawstring (of a medicine bag) & the phrase "mag wire"
In Dune, Paul Atreides takes on the name Muad'Dib (the Kangaroo Mouse) which is related to the concept of 'Mahdi' by similarity of sound and the lessons that are attributed to the mouse. Seems like an interesting trail of correspondence that links in with your mouse experiences. Muad'Dib is associated with earth-spirit mythology and known for his ability to survive in the open desert. Muad'Dib is wise in the ways of the desert. Muad'Dib creates his own water. Muad'Dib hides from the sun and travels in the cool night. Muad'Dib is fruitful and multiplies over the land. The mouse never drinks water, instead deriving it metabolically from the foods it eats. The kangaroo mouse collects food and maintains large caches in their burrows, which are excavated to a length of between 3 and 8 feet (1 to 2.5 meters). The burrow, the entrance to which the mouse covers during daylight hours, is also used to raise litters of between 2 and 7 young. The Pale Kangaroo Mouse burrows only in fine sand, while the Dark Kangaroo Mouse prefers fine, gravelly soils but may also burrow in sand or sandy soil. Kangaroo mice are nocturnal, and are most active in the two hours following sunset. They are believed to hibernate during cold weather. When I was a little girl, my parents were always trying to coax me out of "hibernation", as I was usually holed up in my room doing something. They wanted me to get out more. But, I was happy "hibernating". I still do it. I am a person of the night, a nocturnal creature. Just like Muad'Dib. I usually don't go to bed until about 3:00 or 4:00 in the morning. This is my natural biorhythm. Mouse as a power animal so fits me. In my previous entry, Mighty Mouse Of Emunah, I demonstrated mouse's associations with the south, water, the letter mem, the vowel kametz, emunah of atzilut, and reisha d'lo ityada. In this post, I'll support the association of mouse with "mighty", further support the association of the mem (מ) of masovevet with kametz (ָ) and demonstrate the meditative dynamic of "grip, wander, plucked up" (kametz, siyach, nasach). Third, the meditative action of "wandering around" (siyach שׂיח) the "anomaly of conversation" becomes centered around the mouse. Through mouse's correspondence with mem, water and chochmah - mouse on a more focused level, corresponds to the letter yud י of the Divine Name. Yud (yad, with a kametz יָד) means "hand". Thus, here in the first 3-4 lines, awareness is "gripped by the Divine Hand". This Divine Hand is kabbalistically connected to Yehoshua's semichah (Bamidbar 27:23). Fifth, the meditative action described in the poem connects to the patriarch Yitzchak, who in Bereshit 24:62-63, "went out to meditate  (suach שׂוח) in the field toward evening." Yitzchak kabbalistically corresponds to the sefirah gevurah, might. Here then, is mouse's "mighty" connection. Sixth, taken together, one meditative action giving birth to the epiphany is described here through the dynamic of "grip/gripped by the Divine Hand, encircling and plucked up". Mouse is the key. siyach, suach and nasach are all related derivations through the 2-letter (sha'ar) root שׂח. Interestingly, another 3-letter (shoresh) root derived from שׂח is שׂחה, which means to "swim" and "swimming" - where I (and my "husband") swam out of the water into which we were thrown and meant to drown in yesterday's dream. Earlier this evening, Jack shared the Anishinaabe medicine wheel (shown above) with me. Anishinaabe (keepers/protectors of the Sacred Fire) is one of the two Native American tribes of my ancestors through my father. Interestingly, "mouse" rules the water according to this tribal medicine wheel. Mouse is also one of the two power animals which have "spoken" to me during states of altered consciousness. Significantly, mouse is distinguished by the pivotal role he played to the epiphany of 1967. Instrumental to protecting my life in 1967, mouse may have also protected my life in the event described by my dream this morning. In the dream, enemies attempted to drown me. Yet, I emerged unshackled and alive (as did my "husband") from the water, which mouse rules. This is one mighty mouse I have for a power animal. As mouse is also associated with the south on the medicine wheel shown above, the south I have associated with the vowel (nekudah) kametz on the medicine wheel I made previously. In recognition of mouse's ever-faithful (אמונה) service as my "guardian angel" which endures the test of time, the vowel kametz (ָ) will mark the mem מ (the letter corresponding to water) "casting" my sacred "circle", the one cast by HaMasovevet. Both the vowel kametz and emunah are associated with the sefirah keter; more specifically, with the "unknowable head" in Atzilut of partzuf keter, Reisha d'lo Ityada. May my ancestors and the people Anishinaabe be blessed with shalom v'kol tuv (peace and all good, שלום וכל טוב). Please note, these correspondences have been adapted from several sources and may differ from traditional astrological correspondences. All designations follow the planet for the day according to Sefer Yetzirah. I was a young beautiful woman with long dark hair living in a European medieval country home alone. I was wearing a peasant smock with an apron like those of medieval times. I was, but I wasn't, married yet. Like the formal ceremony hadn't occurred and I was still living as a single woman, yet I had become married in some manner of way. I was still living alone but my husband was on his way "home". I really didn't know who he was. It was sort of like he had married me without my realizing it. I was a bit untamed, so he had done it on the sly somehow. I think he was a bit scared of me, but not scared enough not to do it. Also oddly, I was pregnant by him forward in time somehow, though it didn't show. While I was living alone, another woman came to my cottage to murder me and to assume my identity. She wanted to be me. She and her supporters threw me far out into a large body of water, tied and weighted down with heavy stones, thinking I would surely drown. After she and her supporters "got rid of me" in this manner, the woman magically took on my appearance as she stood on the shore between the large lake and my cottage. She looked just like me. Only she wasn't me. She stood there facing my home as if in some ritual calling for my "soul" to enter her form. She thought she had killed me and was waiting to take possession of both my soul and home. But, I wasn't dead. I had thrown off the stones with which I had been shackled and emerged from the lake. I walked up from the lakeshore, stood behind her and observed her as she worked to possess all that I was and had. She hadn't noticed my approach. Suddenly, I spoke to her. I'm back. You can't have what I am. She fled, vanishing into thin air. I saw that as I had been thrown into the lake, this action had simultaneously displaced most of the lakewater into the place where the man attached to me was. Water rushed into the area, filling and overflowing the structure he was in (and the entire village), covering over the rooftops. He and his dog escaped drowning, exiting the water-flooded house through the roof, swimming to the surface. I saw the man attached to the woman who had tried to assume my identity relaxing in a large indoor pool in a princely-like house overseeing the village. Some of his knights or business associates came in to announce to him that "something" had not gone quite as planned. We are still alive. In Talmud there exists the famous story of Choni HaMa'agel (חוני המעגל). Choni the circle-drawer was a miracle-worker. Nevertheless, I do not want to name the sacred circles I cast as a Jewitch using the root עגל which means both circle and calf. From this root is born the word used for calf in the idolatrous golden calf incident we read about in Shemot 32. Consequently, I won't call myself a Ma'agelet. I prefer to use the root סבב which means surrounding, encircle, rotate and turn events . From this root comes sovev kol almin ("surrounding all worlds"), which is the transcendent Divine energy which permeates the universe. This is the energy I choose with which to cast my sacred circle. During my life, two animals have "spoken a message" to me during altered states of consciousness. The first animal was the common field mouse*, in the "epiphany" of 1967 when I was 6 years old. The second animal was a golden-haired kitten* (cat) around 1987, long before I came to the recent realization that this was a shamanic encounter. It was also before I became a ba'alat teshuvah in 1996. Reviewing my dreams, over the past several recent years and past decade, the animals which frequently appear or have appeared in dream journeys are the spider (mythic and mundane), the lion, the snake (mythic and mundane), the gorilla (in the mythic sense of King Kong), the dog (wild and domesticated), the crocodile, the shark, hornets, bees, buffalo, the bear, the horse (untamed), lice/flea-like "almost" insects, piranha, the meercat and the elephant (mythic and mundane). None of these animals have "mystically spoken", although I have had unusual real-life encounters with both a spider and a snake. In the case of the snake, a very large one was found by my children to live in the basement of a house I rented as a single mom. My children found it one day while putting their bicycles away in the basement. My oldest son killed it and then came and told me about it. Time: around 1992. In the case of the spider, I asked a for a "sign" and if it was "true" I would see a spider immediately. Amazingly, one immediately walked over the edge of my desk onto the top of it and walked across it. Time: 1996. For a short period, about 3-5 years ago, a large mythic land-based whale-like "sea-creature" and a flying dragon made more than a few appearances in my dream journeys. Those appearances stopped as a cluster of spider-lion-snake appearances began. *Importantly, the mouse and the kitten were speaking spirits whose purpose was to protect me. Baruch Hashem for these two special animals who accomplished their purpose at great cost to themselves. What are shamanic power animals? In response to this post by Aron, here are my thoughts on shamanism as it pertains to my experience. Is generally entirely involuntary. 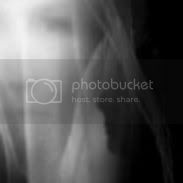 The individual is chosen by the spirits/God/Goddess, often with no warning, and is not allowed to refuse the "gift", or they will suffer illness, and/or insanity, and/or death. They can never stop being a shaman so long as they live, or it will recur. Is nearly always accompanied in the early stages by severe life-threatening experiences, including but not limited to chronic serious illness, psychotic break, and/or near-death experience. Causes radical, unusual, and permanent changes to the aura and astral body. This process is inflicted onto the shaman by the spirits, and is entirely out of their control. Shamanic practice occupies the main focus, time, and energy of the individual's life for the rest of their existence. All mundane careers, projects, etc. are secondary to the shaman's career of spiritual service. Primarily taught by divine and/or spirit teachers, although in the beginning stages the novice is usually taught the cultural context and symbolism by another shaman. Lives are bounded with dozens of increasing taboos, violation of which generally brings immediate illness, pain, or other physical and spiritual retribution. Cannot work entirely alone; must be attached to a tribe. If no tribe is in evidence at the time of their shamanic rebirth, one will be provided for them by the spirits. Is almost always seen primarily as a path of service to a particular tribe (although a particular one hasn't been provided for me yet). Mental breakdown or temporary psychosis common to the early "death-and-rebirth" stage, after which shamans have been tested and found to be comparatively extremely sane and stable. Mental illness never returns as long as they continue to do their jobs. The path of a shaman separates one from the realm of "ordinary experience", particularly during the crisis phase. For one religiously unknowledgeable (as I was) about shamanism, it is likely well into the crisis phase when one discovers he or she has been "chosen". Take a look at Raven's entire article. It's well done and highly informative. I think, "probabilities" (quantum in nature) are made from a series of reiterating yes-no choices as to which "path" reality should take. An actual reality is the sum of the choice which has "accumulated" the most "yeses" during the nonlinear course of the iteration. Consequently, should one's "consciousness" be able to enter into "that place" where those iterating choices are "made" (where making those choices is a function of Binah) then one can influence the manifest outcome. Therefore, I think we indeed can influence outcomes, with Binah-consciousness. What the scientist is talking about in Quantum Miracles could be termed "natural probabilities" while influence through Binah-consciousness I could term "crafted probabilities". Alternative to transliterating the English letters of Lleucu (my circle name meaning "beloved light" and "daybreak") into the Hebrew letters ללאכו, is the phonetic transliteration ללאכי. Lleucu is pronounced "Lly-kee" (i.e. "Lley-kee"). Consequently, ללאכי is a better phonetic transliteration, whereas ללאכו is a better letter transliteration. In both transliterations, the א is vowelized with tzere . Importantly, both forms correctly convey the name in Hebrew, depending upon one's method of transliteration and kavanah. I claim both forms for my circle name Lleucu. In a previous post, I wrote that ללאכו has a gematria of 87, which corresponds to the Divine Name Akvah. Akvah pertains to the right "side" of Divine Da'at (Divine Knowing). Similarly, ללאכי has a correspondence to Divine Names, through its gematria of 91; specifically, to the union of Hashem and Adnut (the secret of amen). Lleucu ללאכו is my name of Shabbat consciousness. ללאכו has a gematria of 87 (see Akvah). It is also the root לאך surrounded by the letters ל"ו (see lamedvavnik). The Hebrew letters ל"ו (meaning "to him") which surround the root also demonstrate that the name Lleucu symbolizes "giving" (mashpia) the light of shabbat consciousness (לאך) "to him". To my true bashert. In addition to my Hebrew names, my circle name  shall I hereby join to them. Lleucu, pronounced "Lly-kee" (i.e. Lley-kee) is a Celtic/Welsh name meaning "light". As "Liorah" means "light to me", Lleucu marks its reception. It is the name of a true mekubal. "And on the seventh day God finished His work which He had made; and He rested on the seventh day from all His work which He had made." I was sitting at a workbench in a laboratory. There were a few others sitting at the bench doing work too. I was doing my work. A female scientist, like a PhD student sat across from us. She wasn't the "head" of the laboratory, in other words. Between the female graduate student and we who sat at the bench was a screen-like structure. As I was writing and doing my work, she kept reiterating a soliloquy of material taken from her research paper. I thought she was practicing for a speech or something. I continued working on my writing, even though it was just my own humble stuff and not a published research paper. She kept looking at me. After she had reiterated the portion from her research paper several times, I asked her - "do you want me to read your research paper?" Yes, she did, and handed me a big scientific thesis. She wanted me to come work as a technician in the lab and to help her with her work. She thought my work was primitive and unimportant. But hers was real research. When I took her paper, she exited to the professor's office to tell him to hire me "for her work". Immediately after taking her research paper, I noticed I became sick. I hadn't been sick before taking her paper, but now I had an inflamed reddish area on the skin (klaf) of my left calf and a large cyst on my left great toe. By taking her thesis to read, she had magically transferred the blemish of her paper onto my klaf. She wants the goodies, and will give me all the gunk to get them. I see how it works now. Some win while we "primitives" lose and pay the way for the winners. Sickening. I picked up my work from off the bench and made a medical appointment. As I walked out of the laboratory, I had no intention of ever going back. I hugged my meager writings to my heart. Maybe they weren't in a fancy published research paper, but they were sacred to me. She had wanted me to forget my "unimportant" work and help her with her "important" work. But, I'm not going to. I'm not going to be her technical handmaiden. Especially am I not going to support the work of someone who despises and sees my work as inconsequential and primitive. As I was waking up I heard the words of a woman - "Keith come in here" (to look at a computer screen) and a woman's laugh of derision. I don't know anyone named Keith. She was laughing at my "primitive" medicine wheel. I knew it. The woman secretly, through the black arts, passed her sickness to me through the research paper and then laughed derisively at my work. I'm never going back to that oppressive lab. I'd rather die dirt poor and despised. And that is likely how I will die, as clearly no one cares and the injustice done to me lives on unchallenged. 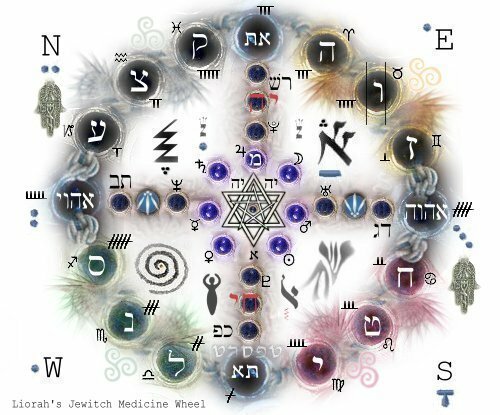 Baruch Hashem for the medicine wheel. 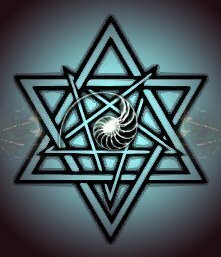 May Hashem bless my humble medicine wheel made with love. Read about the pentagram, the golden ratio and infinity here and here. Read about the hexagram and unique complex patterning here, here, here and here. Read about the golden spiral, the golden ratio, the golden rectangle, the golden string and fibonacci fractals here and here. Every medicine woman needs a medicine wheel. I have created one to uniquely fit my work. It's a Jewitch medicine wheel incorporating elements of Jewish, Celtic and Native American spirituality. In Native American tradition, the medicine wheel "symbolizes the individual journey we each must take to find our own path." 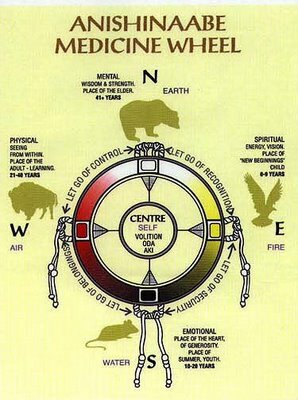 You can read more about the medicine wheel in the Native American tradition here, here and here. Click on the medicine wheel to see a full size view.